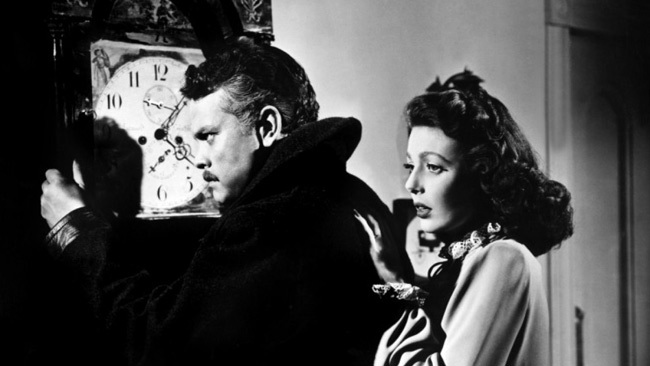 People are strange: Orson Welles and Loretta Young star in Welles' The Stranger. Film Chest’s HD Cinema Classic imprint is presenting its edition of The Stranger (which has long been in the public domain) as a DVD/Blu-ray combo pack. So viewers have the choice of two versions of The Stranger, a film that fans probably first encountered as a scratchy late movie on TV or as a jittery 16mm print in a college film class. The versions included are as beautiful as I’ve ever seen, though there are plenty of scratches and lines visible from the source material. (They’re not terrible, but they are there.) But, overall, the image is beautiful, from the stark black-and-white contrasts of the interiors of the New England college where a Nazi war criminal (Welles) is hiding out under the new identity of a university professor, to the textured, tree-lined exteriors of the college campus. One of the two-disc set’s bonus features is a before-and-after restoration demo comparing this latest version of The Stranger to earlier versions. Yes, there’s a small difference! But as for comparing and contrasting the two editions included in the package, we can’t lie: We really couldn’t discern that much of a difference. Very well-priced at $15.99, this Blu-ray/DVD pack is perfect for fans of digitalized cinema who are looking for a depth in their library as much as high quality; they need to know that the versions of the classics playing on their home entertainment systems are the best ones available. That said, FilmChest’s edition of The Stranger could be the one for them. They can even take the package’s postcard of the film’s original one-sheet (a noir card?) and send a stylish message to friends to let them know how nice the film looks.